...[Pascal's] Pensées tell us that, as soon as we try to moor ourselves to a fixed point, it flees in eternal flight, the abyss reappearing beneath our feet. In a democracy, Tocqueville contends, that fixed point is seen as a condition of equality. However, no sooner does equality appear to be within our grasp than it too eludes us, the desire for equality only becoming more insatiable as we see it hovering in the near-distance. The more equal we are, the more the slightest inequality offends us. Herein lies democracy's greatest peril. Democratic man would give up liberty in favour of equality and the promise of material plenty. 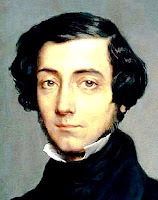 Here too, according to Jaume, are found "the two great ideas that animated all of Tocqueville's thought": the resurgence of despotism and the advent of equality. And it is precisely the prominence given to these two themes by Tocqueville that explains why we still read Democracy in America and why we do so with such profit. Tocqueville, with greater clarity than anyone before him, saw that the equality of conditions typical of democratic society could give rise to a new form of despotism.